Most people are well aware of the existence and purpose of Tarot cards. Few, however, are familiar with the art of cartomancy, which is quite surprising considering the fact that this art is believed to have first surfaced as a divination tool in the 14th Century. Like Tarot readings, cartomancy uses a deck of cards to divine answers to a person’s question. 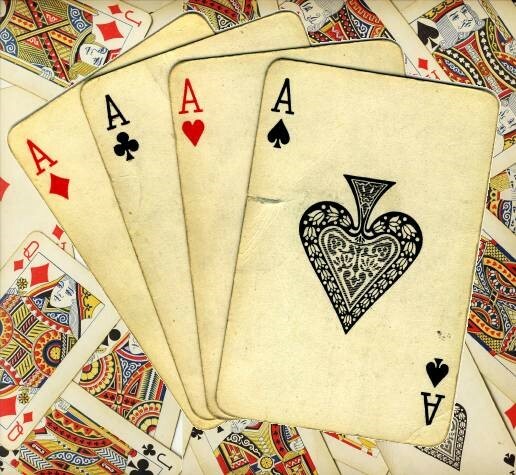 This deck does, however, not consist of the special, usually beautifully designed cards you would find in a Tarot deck, but of plain, simple playing cards you would use to play bridge, rummy or poker with. In other words, cartomancers usually divine answers with the help of 52 cards divided into four suits – hearts, spades, diamonds and clubs – of 13 cards each, although some French cartomancers use 32-card pique decks and some readers use decks including jokers and/or blank cards. Similar to Tarot, Angel and Oracle cards, each card is associated with a different meaning. Cartomancers will use their skills and training to determine which spread they should use for the question at hand, lay out the cards in the required spread and then find answers by interpreting the meaning of the cards in the group formed by the spread. Ace of Hearts: Basically representing the home, this card could, depending on its position within the spread and the question asked, indicate the beginning of a relationship or good news for family members being on the way. Queen of Diamonds: This, the card of gossip, could indicate a witty, responsible, sophisticated and decisive woman. Eight of Diamonds: As the card of money, the eight of diamonds could mean it is time to set a budget or, again depending on its position and the question at hand, an unexpected windfall. Nine of Clubs: Seeing this card, the card of contentment, could indicate that you have completed a goal and/or that you are content. 3 x 3 spread, which is perfect if you wish to get some deeper insights into a certain matter or person. 3-Card Spread, which is good for ‘open-ended’ questions, as it allows for a great deal of flexibility and answers could be concerned with the past, present or future; about you, about another person or about a relationship. 5-Card Spread, which is ideal for questions requiring ‘Yes’ or ‘No’ answers. Seven Fates Spread, which will provide an overview of future life including, for instance, romance and family matters; happiness, wealth and career. All in all, cartomancy is extraordinarily flexible, which, of course, means any question, no matter how it is asked, can be answered. The chosen spread is designed to assist in creating a better understanding of a situation and the cards being brought to the surface after the reader has pondered the question while shuffling the deck will assist in answering the question either with a simple yes or no or a more detailed, in-depth answer.